This is a perfect single-box music source for your modern HiFi system. 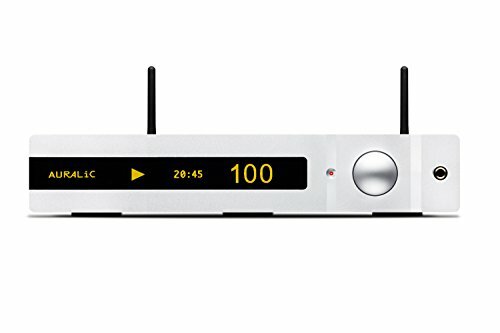 It combines a High-End DAC with world class wireless streaming solution. The 15 input sources including stream from Network Shared Folder, USB drive, Internal music storage (optional), uPnP/DLNA media server, TIDAL and Qobuz streaming, Internet Radio, AirPlay, Bluetooth, Songcast and RoonReady. The rest of digital inputs are AES/EBU, Coaxial, Toslink, USB device to computer, 2 USB host for storage and external DAC. ALTAIR is developed based on AURALiC's award-winning VEGA Digital Audio Process and AURALiC's award-winning Lightning Streaming Platform. Launched in 2014, Lightning Streaming is industry's first streaming solution that supports Quad-Rate DSD, PCM up to 32Bit/384K through Wi-Fi network. Lightning Streaming offers several innovative and unique features such as Gapless Playback, On-Device Playlist, Memory Cache and Bit-Perfect Multi-Room functions. This on-going platform is maintained, and continually developed by AURALiC's in-house software R&D team to ensure customers are regularly updated with new features through the product's automatic software update system. If you have any questions about this product by AURALiC, contact us by completing and submitting the form below. If you are looking for a specif part number, please include it with your message.